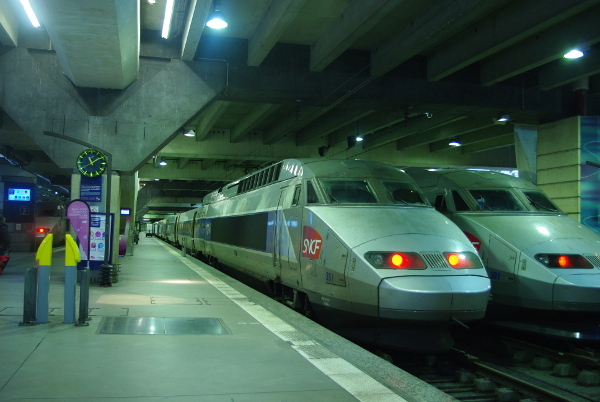 TGVs in gare Montparnasse, Paris. 1. Unlike slow trains, TGVs have numbered seats so it is advisable to book your ticket before departure. 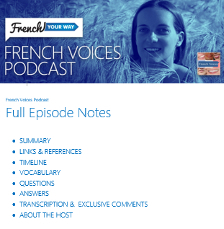 This can be done on the SNCF (national French rail network) website – check www.voyages-sncf.fr , and practise your French reading! 2. 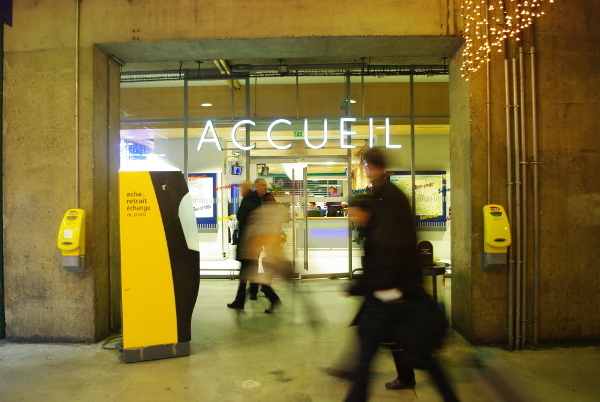 To buy your ticket at the station or for any enquiry, look for the “Accueil” (= reception) sign. You can buy your train tickets here. 3. 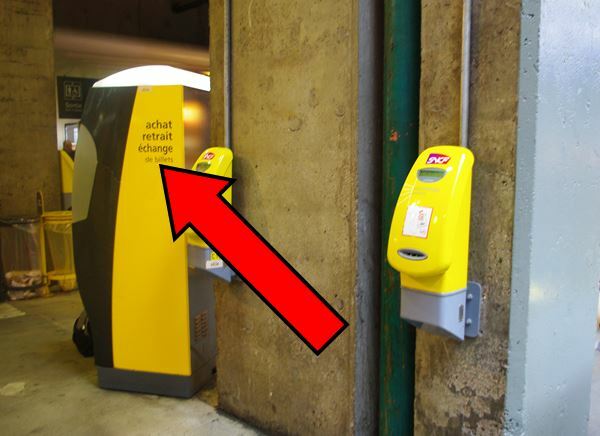 If you choose to do your transactions at the automatic touch screen machine in the station in order to avoid the line: The machine is yellow and says “Achat, retrait, échange” (= Purchase, withdraw, exchange) on the side. Follow the instructions on the prompt. You can also purchase, withdraw or exchange your train tickets here. 5. Make sure you inserted the ticket properly; you should hear a stamping noise and see a green light. 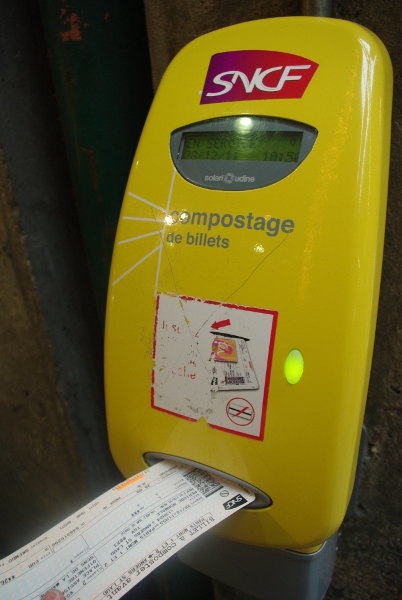 If the ticket has not been properly inserted, the screen will display a “Retournez votre billet” sign (= “Turn your ticket around”), so turn your ticket and try again! 6. 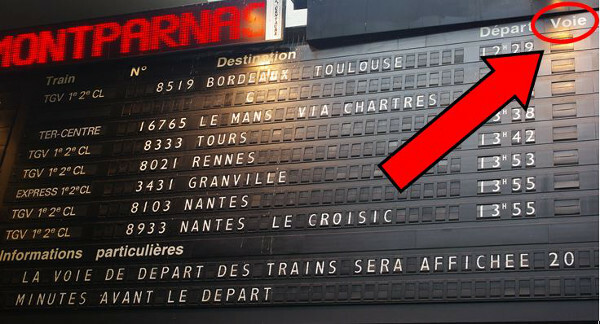 The electronic information board in the station will tell you which platform (called “quai” or “voie”) you will be boarding from. It works the same way as information boards at airports. The platform numbers on this photo hadn’t been displayed yet. 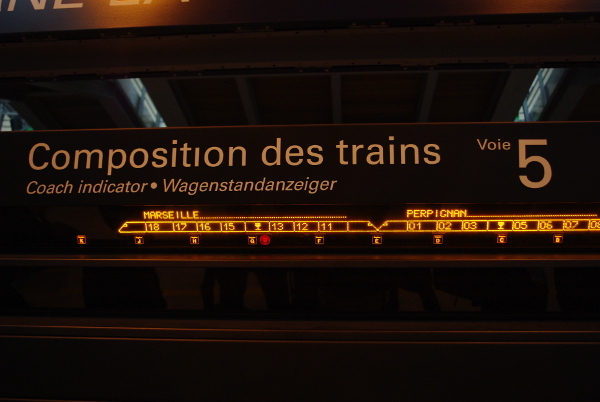 As written at the bottom of the board, the platform number will appear 20 minutes before boarding time. … you don’t want to be standing at the wrong end of the train and have to run like crazy with all your luggage to find your carriage in time! So the trick is: once you are on your platform, look for the coach indicator, an electronic panel displaying the map of the train. 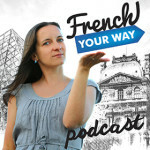 Find your carriage (“voiture”) number on it and look for the closest letter. This letter is a landmark. Find the letter on the platform and go stand under it. Your carriage will arrive in front of you or very close! Look for your carriage number here and then find the landmark letter on the platform. 8. Make sure you travel in the right carriage, especially if two TGVs are going to split along the way…unless you want to visit an unplanned destination! 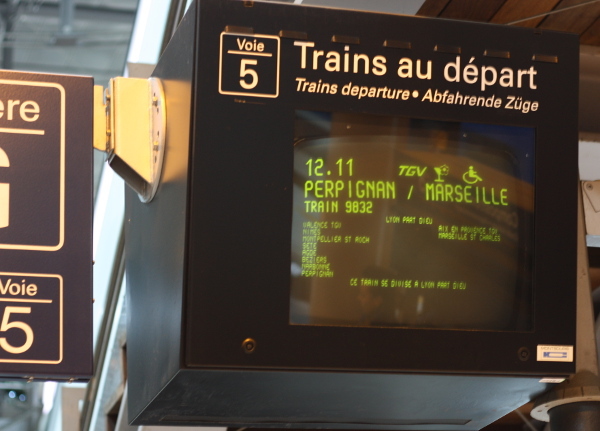 This train is not going from Perpignan to Marseille : it is actually 2 trains attached and SPLITTING in Lyon. One train will then head to Perpignan and the other one to Marseille! 9. You can walk freely in the train (but carry your ticket on you in case you meet the inspector). The bar/snack carriage is located in the middle of the TGV. 10. Ticket inspectors (“contrôleurs”) are always on board! If you forget to validate your ticket, you need to go find them on board before they come to you! Explain your mistake: “J’ai oublié de composter mon billet” (=”I forgot to validate my ticket”). The inspector may charge you a small on board validation fee, but that will still be cheaper than getting fined. And if you give them a nice smile, they may not even charge you anything (I’ve tried that, it worked! 😉 ). 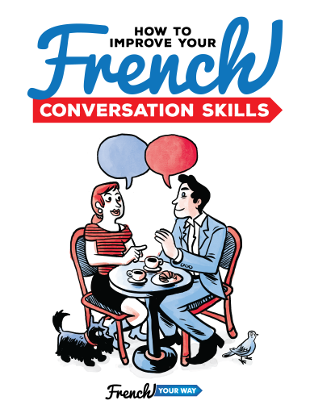 Which tip was the most helpful to you? Comment below!